Multiple beacon formats ranging. This application provides a quick demonstration of the DA1458x. Using the beacon software the Bluetooth device is able to advertise in three different formats: Eddystone, iBeacon and AltBeacon. The app detects both iBeacon and Eddystone format. Once the mobile device gets close to the beacon the app displays an image, depending on the beacon, and some detailed information. Using the overflow button in the upper-right corner it is possible to change the RSSI threshold and offset. These values are used to determine the required signal strength of the beacon before the data is displayed on the screen. Dialog's battery-powered Bluetooth Smart beacon is built on the DA14580 Bluetooth Smart chip and takes advantage of the chip's world's lowest power consumption and size. The PCB dimensions measure only 16.9 x 23.7 x 1.0 mm and battery lifetime based on 70 mAh battery with 5 sec advertising is 730 days! For more information, see the reference design on Dialog's customer support site (registration required). Interested in developing your own iBeacon and Eddystone applications using Evothings Studio? See the iBeacon and Eddystone guides. The directory DA14580 contains the binaries for the DA14580. These files contain the generated firmware needed to advertise multiple beacon formats. Each binary advertise different beacon data. This data is used by the app to distinguish different beacons. This example works with a DA14580. Visit dialog-semiconductor.com for further details. Turn on the DA14580 (make sure to use the correct firmware). Launch the example “Dialog Semiconductor Beacons” from the Workbench window in the ‘EXAMPLE’ tab by pressing ‘RUN’. In the app, press ‘START EDDYSTONE’ and ‘START IBEACON’ to start scanning for iBeacon and Eddystone beacons. Move in range of a beacon and a picture will appear! 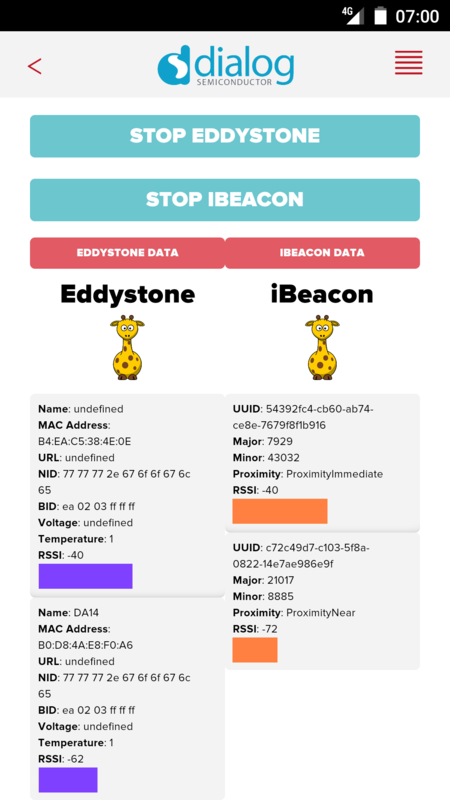 EXTRA – Press ‘EDDYSTONE DATA’ or ‘IBEACON DATA’ to see more about the nearby beacons.